I was in Toronto a few weeks ago for work, and luckily my friend Kat lives up there, too so I had someone to show me around town. We walked around downtown a bit and went to the AGO (Art Gallery or Ontario) They have a great collection of works, and one particular room I loved where contrasting styles all hung side by side in big, beautiful frames. I also got to meet Kat's new man, Derek. The two of them made fun of my "accent" while we ate pad thai. I learned a lot about Canada that I didn't know before. But most importantly did you know that they have milk in a bag instead of a carton? 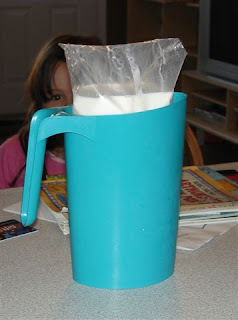 I knew Canadians were weird, but milk in a bag? Almost beyond my comprehension. What do you think, eh?